A new, low-absorption, lightweight aggregate, optimized for manufacturing ready-to-use putties, plasters, spackles, grouts, sealants, adhesives, and other paste-like products, has been developed by Dennert Poraver GmbH and Poraver North America. Poraver X delivers the promise of a lightweight filler that resists liquid absorption, offering manufacturers the ability to make products that remain stable and workable, and maintain their as-manufactured consistency with long shelf-life. Poraver X is being debuted at the 2016 edition of World of Concrete, the world's largest concrete trade show. The Poraver X available in (3) granule sizes. 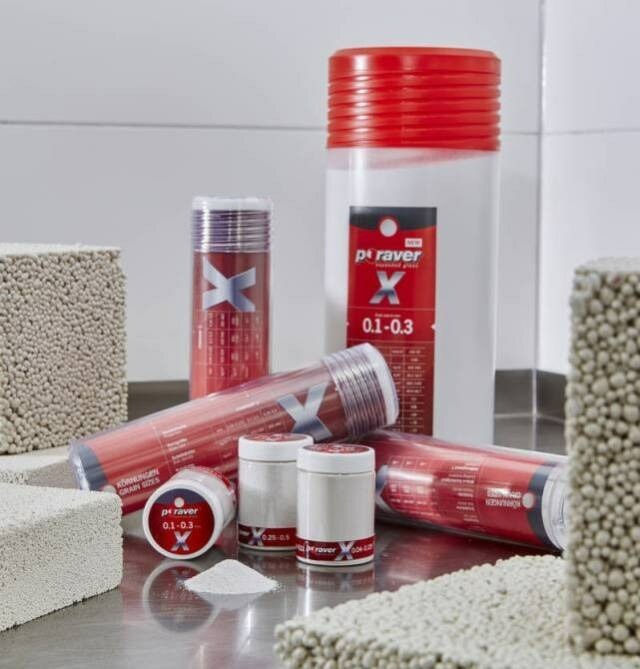 Poraver X was created specifically to meet the challenges of producing paste-like construction materials. It is made from pure recycled glass, expanded into closed-cell granules that are 80% lighter than solid glass. The closed surface structure of the granules makes Poraver X highly resistant to liquid absorption, creating a high-performing, lightweight filler that can enhance many ready-to-use construction products. "Poraver X will enable manufacturers to achieve high yield and reduced weight in a product that retains the consistency and workability the manufacturer intended," explained Dr. Michael Monz, Technical Sales Director International of Poraver. "These closed-surface granules of pure glass minimize liquid absorption, saving on binder costs, and keeping the binder available in a fresh, workable mix, even after a year of storage. It is our hope that Poraver X will help manufacturers achieve a high level of consistency over the entire shelf-life of their products." This low-absorption aggregate addresses one of the chief challenges of making ready-to-use paste-like materials, which are expected to come out of the package at a workable consistency, whether they were batched a week ago or a year ago. Other porous lightweight fillers gradually absorb the liquid components, robbing the mixture of is workable consistency. Although Poraver X granules are porous on the inside, with just 20% of the density of solid glass, their closed, glazed surface prevents those internal pores from stealing liquid from the mix. Poraver X is also extremely light in color, a distinct advantage for appearance products such as decorative fillers or natural stone adhesives. Poraver X is manufactured from environmentally friendly post-consumer recycled glass and is free of toxins and solvents. It is non-flammable and does not release any harmful gases in the event of fire. Poraver X's round grains promote good flow, enabling easy conveying and dosing during production of ready-to-use products. Poraver X is available in three different granule sizes, which can be combined to achieve optimal packing densities and a high filling level, minimizing binder content and reducing shrinkage. Poraver X will be available in Europe, North America, and throughout the world in early 2016. For more information, please visit www.poraver.com/us.